The diversity of experiences in the bush is clearly depicted in the last few posts, from gentle motherly love to uninhibited ferocity. This clan of hyenas was found feeding on an impala ram. As the meat was being depleted a large female took the carcass, ran off to pan and dunked it under water in an attempt to hide it, and have the spoils to herself. 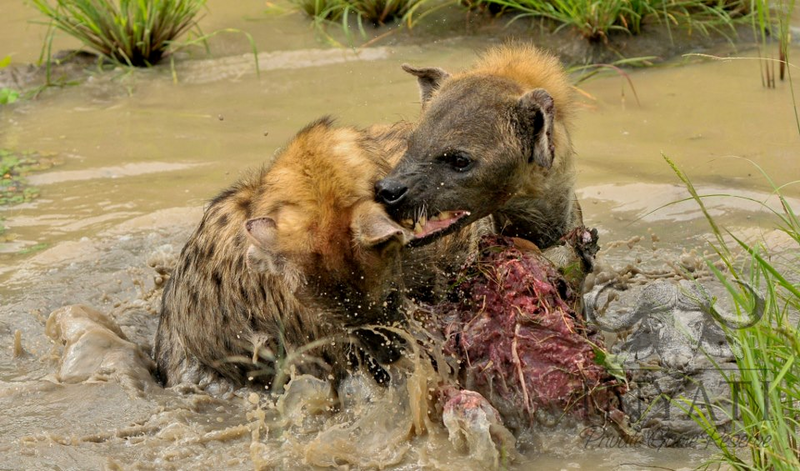 The only hyena bold to challenge the presumed matriarch was a young animal, possibly one of her own offspring. The large female responded by biting a small piece the challengers ear off.